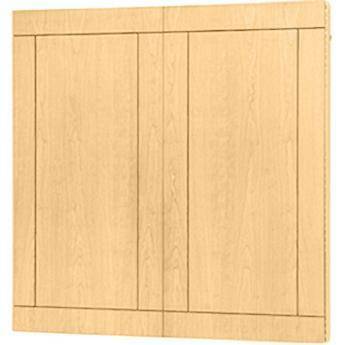 The Da-Lite Providence Conference Cabinet 48 x 48" (Honey Maple) uses a contemporary curvilinear design making it universally suitable for a plethora of applications including conference rooms, private offices and training rooms. This cabinet has an integrated pull-down projection screen with a Matte White surface and a magnetic steel whiteboard. Each door has heavy-duty spring clamps for presentation materials plus this cabinet includes a marker tray and accessory kit with a paper pad, 4 dry erase markers and eraser, whiteboard cleaner and a telescopic pointer. Box Dimensions (LxWxH) 55.0 x 54.0 x 8.0"